Antico and Reclaimed faux brick have been created to revolutionize the way brick paneling is installed. Instead of dealing with expensive preparation of the substrate and using mortar with grout, these panels can be effortlessly attached to any existing surface in minutes. Choose from the three types of available sheet styles, the Antico, the Villa and the 28 in Reclaimed Chicago style brick. Introducing our faux 28" Chicago faux reclaimed brick panels. This beautiful and crisp product is more affordable per square foot and easier to install. It also much cheaper to ship overall. Whether you need brick siding materials or just brick wall panels for an interior DYI project, these are the faux sheets for you. These are also ideal for brick exterior work because they are treated with multiple layers of acrylic exterior paint. SCROLL DOWN TO SEE ALL THE COLORS AVAILABLE. 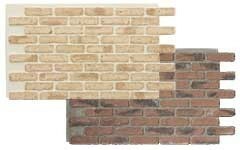 Our Contempo brick faux wall panels are our newest addition to the line of brick paneling. It brings a touch of contemporary style but still applicable to traditional designs. Based on the color chosen you can completely change a a traditional or contemporary wall into a rich imitation brick wall. These are also ideal for brick exterior work because they are treated with multiple layers of acrylic exterior paint.